in different fields of study for Bachelors, and Masters. you can apply for BS - Bachelor of Science, BS (Hons.) - Bachelor of Science (Honours), BSCS - BS Computer Science, and BSSE - BS Software Engineering, MS - Master of Science, M.Sc. - Master of Science, M.Phil CS - M.Phil Computer Science, and MSCS - MS Computer Science, . 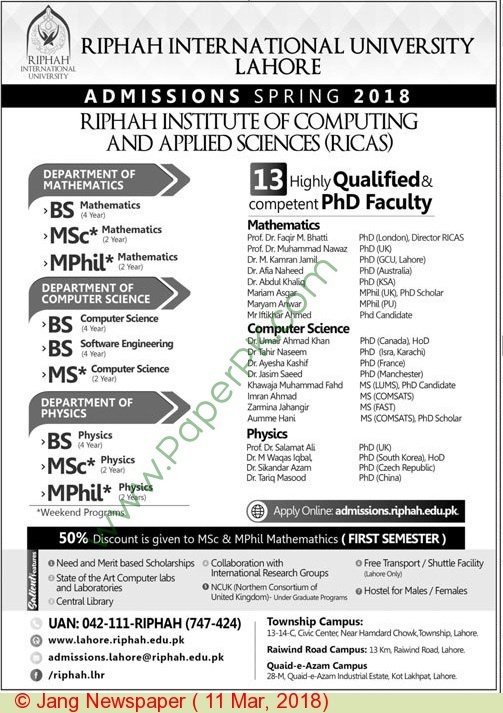 Riphah International University is offering admissions for it Riphah Institute of Computing and Applied Sciences (RICAS) for the departments of Mathematics, Computer Science and Physics, RICAS includes the 13 highly Qualified and competent PhD Faculty. Hostel for males and females. University Address Township Campus: 12-14 C, Civic center, Near Hamdard Chowk, Township, Lahore. Quaid-e-Azam Campus: 18-M, Quaid-e-Azam industrial Estate Kot Lakhpat, Lahore.